IN his continuing search for the more weird, wacky and wondrous in the world of travel, David Ellis says an old mate who has been a near life-long devotee of Batman and Robin comics and movies, has not been the same since doing a tour earlier this year of the Warner Bros Studios in Burbank, California. 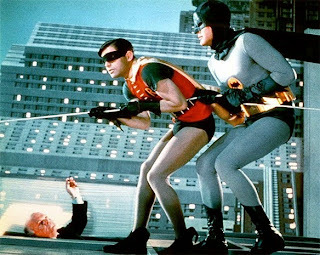 Because he'd always thought that those who played The Caped Crusader and his juvenile side-kick in the first Batman movies in the 1960s really did scale the outsides of tall buildings for the sake of Saturday afternoon movie-going kids like himself. Thus he was horrified to see on his movie-lot tour how it was really done – and that was by having the crime-fighting duo supposedly "scaling tall buildings"… by merely having them crawling along a wall-like structure laid flat and safely on the studio floor. Furthermore a picture of the supposed skyscrapers of Gotham City around them was actually projected horizontally on a screen behind them, and while Batman's cape looked like it was hanging street-wards from his shoulders as he appeared to be climbing vertically, it was simply pulled horizontally from off-screen. Finally to complete the trick, the movie camera was mounted at 90-degrees to the norm.